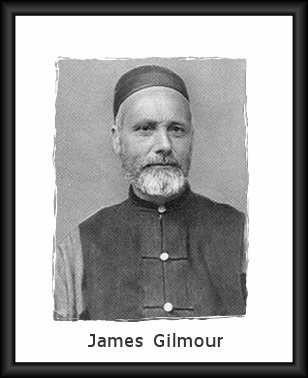 James Gilmour (1843-1891) was a Scottish missionary to Mongolia who made lonely, heroic efforts to preach the gospel to a people steeped in Lamaist forms of Buddhism; spending summers with nomadic Mongols on the plains of Mongolia and winters with Mongols in Peking. After his wife died in 1885, he labored in eastern Mongolia until his death at age 47, after 21 years of missionary service. James Gilmour. Short biography and chronology of events. James Gilmour: The Apostle to the Mongols. James Gilmour: In the Steppes and Deserts of Mongolia. James Gilmour: A Courtship By Correspondence. James Gilmour: A Mission Journey in Mongolia. James Gilmour. Chronology of life. Emily Prankard Gilmour: Traveled from London, England, to Mongolia to marry James Gilmour on December 8, 1874. Learned to speak the Mongol language and willingly shared her husband's experiences and dangers. Twice she spent the summer travelling about the plains of Mongolia with him, sleeping in a tent, and enduring hardships. Physically unable to endure such a hard life, she worked among the Chinese girls in Peking, where her husband joined her in the winter to work among the Mongols who came there. They had three boys: James (Jimmie), William (Willie), and Alexander (Alec or Alick) who died as a toddler. Mrs. Gilmour died on September 19, 1885, not long after the birth of their third son. See interesting information about their marriage.